Ken Heebner, the co-founder of Capital Growth Management, a money management firm with more than $6 billion under management, disclosed in a just released 13F filing that his hedge fund has dumped almost its entire 1.15 million share stake in Apple Inc (AAPL), leaving him with just 111,000 shares. The news may be contributing to a big decline in Apple today. Its shares are down $10.17, or 3.20%, to stand at $306.82 as of 12:58 pm (ET) after earlier falling as much as $13.00 to touch an intraday low of $303.63. Shares of Apple have been moving largely higher over the past three months, but seem to have once again found resistance at $320. 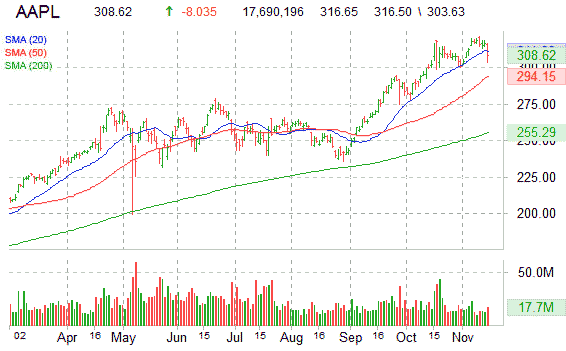 On a intraday basis, the stock has currently broken through the $310 level, which has brought it back near its $294.14, 50-day moving average. AAPL currently trades at a trailing P/E of 20.26, a forward multiple of 13.99 and a price/earning to growth ratio of 0.84. At last check, the ticker of the $281 billion market co., which has already traded more than 17.6 million shares today, while the average 12 week volume is 18.7 million shares, were off $9.97 to $308.28.